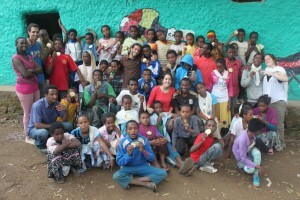 Yenege Tesfa and Project T.E.N join forces for an outstanding summer camp! 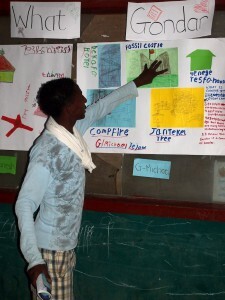 School vacation was far from being without learning for Yenege Tesfa children this year! We have recently partnered with a new volunteer organisation here in Gondar – Project T.E.N., and their first task was the successful implementation of a 5 week summer camp for our children. The camp was planned by our 6 new volunteers and run alongside some amazing university students from Gondar’s own community. The camp was packed with education – English classes, art classes, sport activities and drama classes too! Once a week there was also a themed day where we had the opportunity to bring in outside professionals with in-depth knowledge on topics such as hygiene, leadership, gender and environment. The 5 weeks ended with a show of the children’s talent. The older children of Yenege Tesfa worked throughout the camp on a project titled ‘What Gondar means to me’, and spoke beautifully when presenting their work to a hall filled with people. 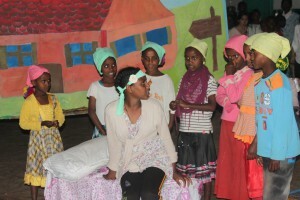 Their presentations were followed by a drama production that the younger children had been working on during the camp with the help of an enthusiastic and hard-working drama teacher. The story of ‘Conjit and the 8 dwarves’ was unbelievable to watch. The staff’s hard work coupled with a grand set made up of 3 large backdrops and most importantly the confidence and talent of the children themselves, pulled off a spectacular play that packed out a hall – even the Mayor of Gondar came to watch! All in all, the camp was a fantastic experience for everybody who took part and will be well remembered for a long time to come!